You may be in for a surprise! Very few people understand the plain, scriptural truth about what a "Christian" really is. What would Jesus think of our modern definition of a "Christian"? The truth is that very few people in this world realize what a true Christian really is. A poignant illustration of this fact is contained in the primary definition of the noun "Christian" in Webster's New Collegiate Dictionary, Here it is: "One who believes, or professes or is assumed to believe, in Jesus Christ, and the truth as taught by him." Most of us realize that our modern age has strayed far from the deep faith in God held by our forebears. 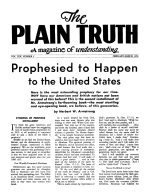 This is the atomic age - the age when God seems "Out of date" to many of the younger generation.